It’s not often I read something that leaves me with my mouth hanging open in frank surprise at the end. I’ve seen a couple of movies that managed to drop my jaw at their incredible, “I didn’t see that coming” moments but rarely have I had a book trigger that same response. 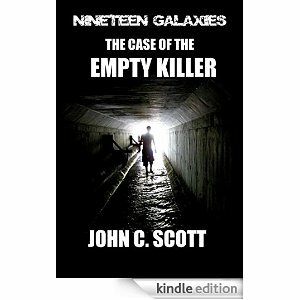 The Case of the Empty Killer by John C. Scott, left me with my jaw flapping in the breeze and I’m happy to recommend that you read it in hopes it prompts the same response in you. I hate to be so vague but I don’t want to spoil not one riveting minute of reading I think you’re going to have by giving anything away. I will tell you this, there’s a manhunt that takes place in the sewer tunnels under the city. There were sections of those scenes where my claustrophobia was triggered – they were that intensely written. While you’re at it, I highly recommend you go and read a couple other books from the Nineteen Galaxies collection – first and foremost, the tale that started it all, The Legend of Adam Caine. Um, can you say hot, hunky British Marine? Yes, well, I sure can and I say it every time I talk about this book. Adam Caine is my first ever lit crush. He’s also who I consider to be the sun around which the Nineteen Galaxies revolve :-). A bit over the top huh? Sorry. *ahem* The book is superb; a wonderful introduction to the character. The other book I’d recommend is Recon One-Five. It reads like a blockbuster action movie. There were points where I had to put it down in order to catch my breath :-). There’s also Ghosts of Earth. This is an epic sized book and I have to admit, it’s slow going. Still no less well written, it’s just taking me a longer time to read it. :-). I’d still recommend it and I’m not quite half way through. What I like most about all of the work I’ve read so far is that, even though each story is a part of a whole lexicon, each book I’ve read stands firmly in its own light. It’s a series, but not a series if you get my meaning. You don’t have to read them in any particular order, though I would suggest you make The Legend of Adam Caine your first read. Bottom line, if you’re into science fiction, amazing battle scenes, characters that, human or alien, are well-developed and written in such a way that they seem real, then you’ll enjoy John’s work. His is the first and only science fiction I’ve read that keeps me engaged, doesn’t bog my reading experience down with such high level science-y stuff that I spend more time Googling than I do reading. You can find John on Facebook, and here on WordPress. Previous PostAnother Nowata Press Book Baby is Born!Next PostWait – I’ve read how many books in the last few weeks? Did you like the bromance? Ooh, and the Back to the future reference? Dude, the whole thing rocked. I like Ruul and Cameron’s deal for sure – excited to read how you work that out. You ARE going to work that out right? Before anyone dies, right? :-). I think a story where Ruul and Mando spend more time together will bring out their relationship more so than in The Case… It’s there, but they don’t spend nearly enough time interacting for me to get caught up. I may do, who knows? Vin-Bornn will be a part of the Core War in some fashion, he may even be instrumental, not sure yet. Plus there’s the aftermath to deal with, of course. But as for Ruul and Cameron… not sure yet. Not sure yet?!! o_0 (lol) That’s just cruel to leave me hanging like this. Hehe, can’t reveal everything straight away! Oh and Dana? Get on with Ghosts of Earth woman! If for nothing else other than Adam’s progression! And remember that revelation in Fall of Terra of his birthright…. READ GHOSTS….